Shopping in Costa Rica can be quite a challenge but is proving to be a great new adventure. I went grocery shopping with Charlotte last week and we stopped off at Auto Mercado and the Luperon. Auto Mercado (AM) is a grocery store which appeals to the North Americans, a number of the staff speak english, they have air conditioning, but items can be somewhat expensive if they are imported. I tend to buy items here that we are used to and aren’t produced locally such as Clamato juice. The Luperon gears more to the locals, no air conditioning but some great deals on meat and a large variety of exotic fruits and veggies. At the AM I bought some bran flakes for breakfast along with individual yogurt cups but sadly no blueberries. I forgot to get milk though so when we went to the Luperon I picked up what I thought was milk “Leche”. The next morning was a surprise when I added some chopped pineapple to the cereal and some of the milk. The milk tasted sour and John gave me a lecture on tasting things before I used them for cases such as this. Dinners at the condo are always great fun and allows everyone to try food from different places, get to know new people and learn new things about Costa Rica. Currently there are folks from: Costa Rica, North Carolina, Louisiana, Seattle, San Diego, Toronto and Vancouver. The other day Danny and Vicky planned a dinner before they went home and invited a group of us for a dinner. They were going to make Louisiana chili, Gord offered a traditional cornbread baked in a cast iron pan on his barbeque and I planned on some cheddar biscuits. Now that I had offered to make biscuits I was going to have to go shopping again. I needed pretty much everything from flour, baking powder, eggs etc so I dragged John to the Luperon a block away from the condo where hardly anyone speaks english. I picked up a package labelled Harissa that I hoped was regular flour and not the usual corn flower, eggs and butter. They didn’t have any baking powder so I thought to borrow some from our neighbours Charlotte and Gord. Gord mentioned that one of the best leavening agents is buttermilk when I thought about the milk that I had thought was bad. When I returned to the condo I looked up the translation for the milk, leche agri and guess what it was sour milk so voila my leavening agent. I checked the Spanish translation for the flour as well just to make sure…. Wheat flour enriched with iron and folic acid. Not something I would expect in Canada but it would certainly do the trick and a few more vitamins would never hurt. I was now ready to make my biscuits. The flour here appears a little darker, the butter (mantequilla) is more yellow and the eggs are mostly brown and sold in packages of 15. I mixed the ingredients together while John grated the cheddar cheese. The cheese was expensive as well as it was imported from the States. Not expensive though are jalapeno peppers which I minced and threw in with the batter as well. The batter was a bit wetter than normal but it was too late to turn back now, so I ended up rolling them into balls and flattening which was just as well since I don’t have a rolling pin yet. They turned out surprising well considering this was my first attempt baking anything in our oven in the condo in Costa Rica when the outside temperature was 90 degrees. They were light, flaky cheesy with a bite and the best part there weren’t any left over. My next project is to set up a shopping list with the basic list of things I need and translating them to Spanish so I will know what I’m buying next time I go shopping. The other day John and Danny were walking the beach on the way into town when they met a couple of fishermen. These Ticos were actually surface supplied divers who fished with spear guns instead of fishing rods. It was early in the morning and they were just getting ready to set out. When asked what they were fishing for they mentioned langosta (small spiny lobsters) and pulpo which are small octopus as well as other fish like grouper and shrimps. They told John and Danny to come back at three to check out the catch. To prepare the octopus Gord parboiled it for about an hour to tenderize it and then placed it in a marinade for an hour or so. The marinade is a mix that they brought from BC that I haven’t seen before but is a blend of Greek spices including garlic, onion, oregano. Charlotte says it really picks up a greek salad. I’m not exactly sure when but they mentioned that they took off the head and grilled the legs only. 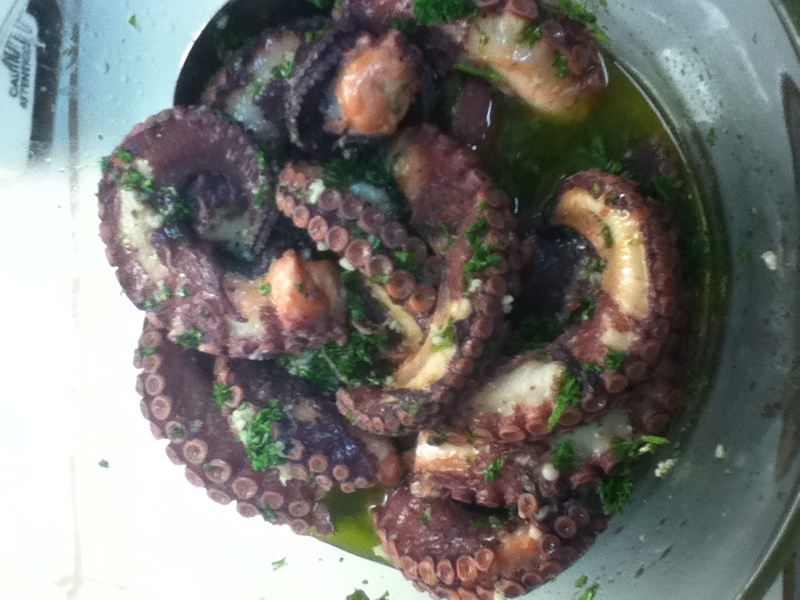 They had the pulpo with a greek salad and were kind enough to let us try some. It was really tasty and amazingly tender and I think even Charlotte was surprised. Maybe we can talk Gord and Charlotte into showing John how to do this. Not that we could get fresh octopus in Brampton but we heard yesterday that the St Lawrence market in Toronto was named the world’s best food market by National Geographic and I am sure we could get some there. Otherwise we may need to go to Detroit….Ha Ha. They’re still playing hockey in Canada eh ? We were not quite as adventureous to try cooking our own pulpo but John tried octopus carpachio at a local Italian restaurant in town. Danny mentioned that he had it there regularly as an entree with a glass of wine but when we arrived at the restaurant we discovered that it had recently changed hands. The Dolce Vita had a new chef from Italy who had recently left a five star michelin restaurant in Italy to come to Costa Rica and this happened to be the daily special. I think we had a bit of a communication issue as the waiter spoke a little spanish, italian and english and the carpacio appeared to be more of an appetizer size than a main. So now that we have a huge bowl of mangos we need to come up with a number of recipes for them before they go bad. We gave a number of them to our neighbours but we still have enough to feed an army. 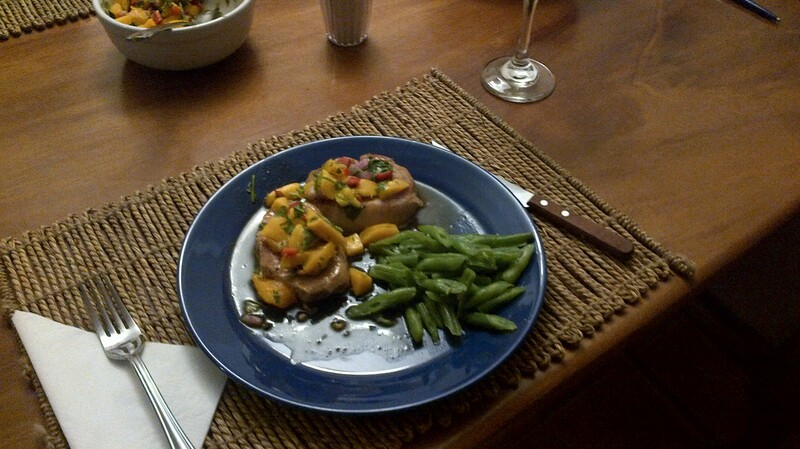 One night we made up a mango salso to go with some pork chops. It’s quick, easy and really delicious. We didn’t usually enjoy sweet and savory together but we are enjoying the combination more and more. Mix all the ingredients together and let it meld before serving. One recommendation is to put it under the broiler for a moment just until it starts to brown and carmelize to bring out the sweetness of the fruit. 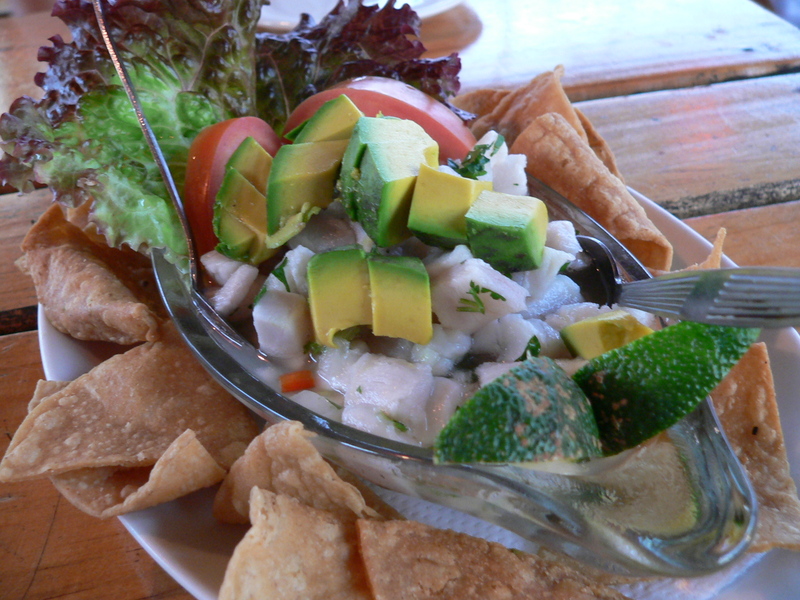 When we were in La Fortuna, in the shadow of the volcano, we had dinner at the Lava Lounge and started with Ceviche which is fish bits which have been “cooked” in lime juice. It is a local specialty that is great with all the different fish they catch here. This is the picture of the Marlin dish we had there but I have also got an actual recipe from our Rasta friend Roy. This was served on a bed of lettuce with avocado bits and tortilla chips. John and Roy also partook of a couple of Cerveza Michelada. 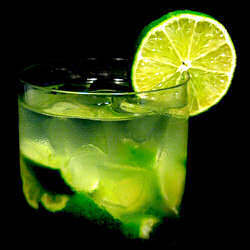 It is similar to a Shandy except that it contains lime juice instead of ginger ale. 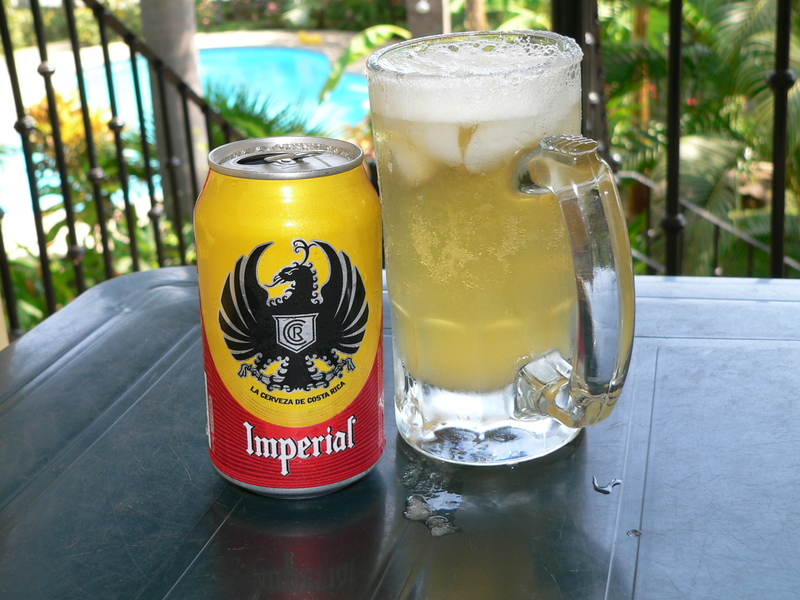 Take a can of your favorite beer (Imperial is the local beer) add a couple of squeezed limes over ice and with salted glass rims. They are really nice and refreshing and takes away some of the harsh taste of beer. When you add the beers it gets quite frosty so be careful when pouring. And of course here is John enjoying one. The following recipe is from Roy who went out spear fishing last night and caught a couple of Parrot fish. He and his cousin went over to Ocatal beach (which is 10 minutes away) with their snorkel gear and spear guns. The water was a bit murcky and it took them awhile to catch a few but it was certainly worth it. and the secret ingredient – well not any more – ½ can of ginger ale. The taste is really great, the fish is fresh and the marinade very refreshing. This should be eaten quickly and not stay in the marinade too long as it will make the fish mushy. We went shopping the other day to the local “mercado” (grocery store) in town and picked up some more food and restocked the bar. Costa Rica is such a sensible country where you can buy beer, wine and liquor in the grocery stores and the prices are reasonable. John bought a bottle of Jose Cuervo tequila which is the same as the one we get in Canada but at half the price. The imported wine from Chile is a steal and they sell gallon jugs of vodka and gin for $20 US. Too bad we can’t get that in Canada but then when I think about it maybe that’s a good thing. 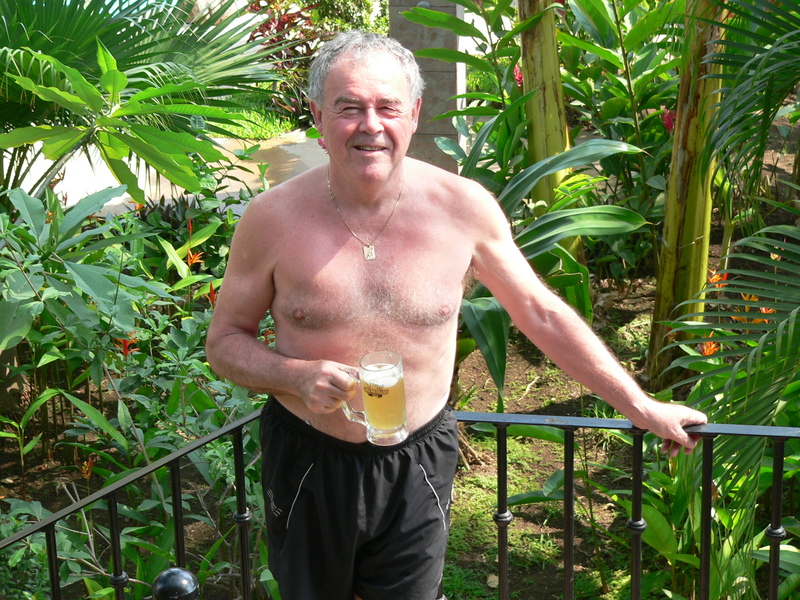 John fondly remembers swigging tequila with Erin at the cottage with Susan complaining about noise a couple of years ago, but that is another post for another day. The food prices are reasonable as well. We bought a great tuna steak for $10 US, which John cooked to perfection – seared perfectly but still rare and served with…..what else rice and beans. We still need to get into the habit of taking pictures of our meals for these posts but maybe mañana (tomorrow). Avocados, cilantro, limes, and fruit are also great deals. We try to do the grocery shopping early in the morning to avoid the heat and have also found a taxi driver who speaks more english than we speak spanish. The ride back to the condo costs $2 US and the driver Manuel (of course) helps with the bags. However John decided it was much too hot (mucho caliente) and decided to mix up a batch of margaritas which we had with breakfast or lunch, we’re not sure which. I call these Poor Man’s Margaritas since we didn’t buy any Triple Sec or Cointreau which the standard recipe calls for. These drinks are potent so unless you don’t plan on working for the rest of the day I would hold off until later in the afternoon, after the siesta, along with the guacamole and tortilla chips. Rim a glass with lime juice and salt. Pour into the glasses and enjoy. This makes about 1 cup of dip to enjoy with tortilla chips. 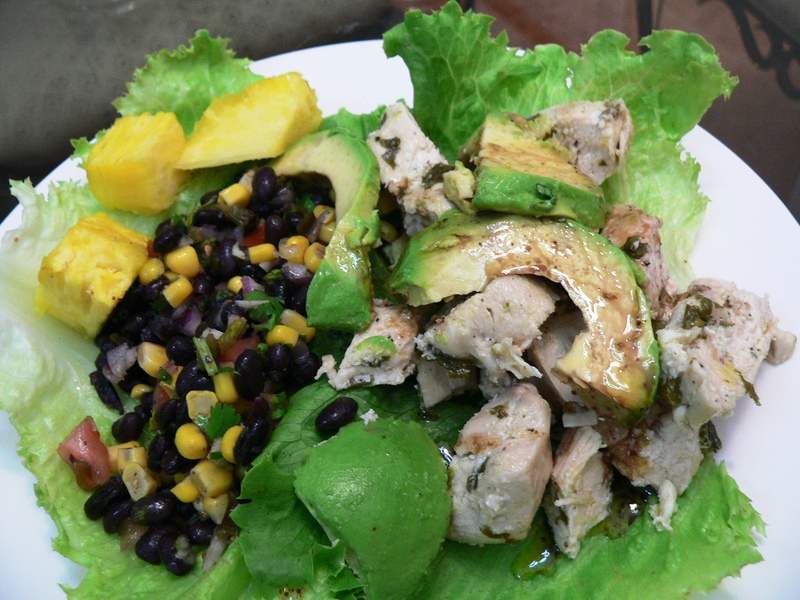 Beans and rice are staples of Costa Rica and they are included in almost all the menus around town. We picked some up at the grocery store as we have a favorite black bean salad and I will eat rice just about every day except those days when we’re having pasta. Just kidding…..even though John thinks that’s true. So John is helping out and decides to get the beans ready by soaking them in cold water first. He puts the entire bag 900 gm into a pot, covers with water and leaves them to soak “y luego” (and then) we have beans, beans and more beans. So we are going to have to create a number of new recipes to use them up. Here is the salad that we enjoy on the hot days. It’s nice and refreshing and good for you too cause you can never have enough beans. Mix the contents and let sit for an hour or so to allow the flavour to meld before serving. This is a great refreshing salad to go with fish, chicken etc. In honour of our new travel adventure, here is a recipe for a drink that is perfect for sipping on the beach or at the pool. We discovered this during our first trip to Costa Rica but it is actually Brazil’s national cocktail. Make a big pitcher, stick it in the fridge and enjoy. Simple syrup is one part sugar to one part water. Either heat over the stove or add water from a kettle and stir until the sugar has dissolved.